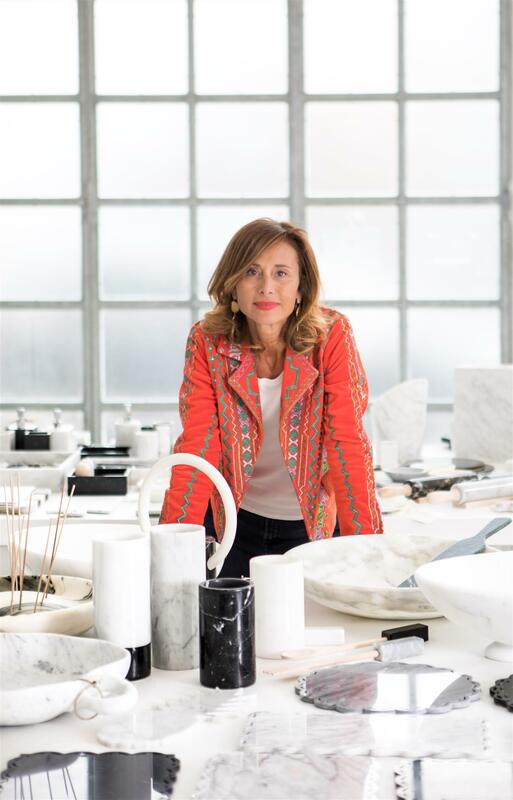 To conceive marble with a feminine sensitivity, the idea of Fiammetta Vanelli, a woman entrepreneur, with a family history of almost two centuries linked to the extraction of Carrara marble. She was born in Carrara, with the art and marble in her DNA. She graduated in Philosophy and Letters at the University of Florence with a final exam on Samuel Beckett and the Visual Arts. After some international experiences, the enlightenment, to go back to Carrara and continue the unbroken link that unites since 1800 Fiammetta and Vanelli's family art and marble beauty. She founded then with this spirit STATUARIA ARTE a '' laboratory '' of art with the spirit of Renaissance in which she accept several artists. Designers were called to create and experiment with forms, shaping the materials, interpreting the marble combining the local tradition of craftsmanship applied to robotics technology. The world of Fiammetta expands constantly, opening up to new horizons. Educated businesswoman and visionary, philanthropist and patron, she tirelessly organizes art exhibitions, promotes sculpture courses for young international students, working with talents such as Matthew Spender, Marco Borgianni, Alessandro Mendini and Rudy Wach. ZONA67 was founded in 2001, this is the number of the family quarry. A jewelry brand only manufactured using all variants of the precious marble of Carrara. Combining art and fashion, Fiammetta creates unique works with contemporary design, unique objects, true art sculptures worn during the Milan catwalks. The 2014 sees the opening of the epithet brand, FIAMMETTA V. Home Collection. The Bianco Statuario, Paonazzo, Nero Portoro and Grigio Bardiglio are carved like precious stones making these products designed to ennoble the daily: jewelry, key chains, cufflinks, buttons, but also, lamps, platters, wine coolers and sushi sets designed by national and international artists to enhance the marble in all its preciousness and beauty. Made entirely in Carrara these objects represent the skills and culture that have made the Apuan's district reknwn in the world. Small craft masterpieces carved in the most beautiful ornamental stone that nature has ever created, almost unique pieces distributed only in the most exclusive design showroom in the world such as 10 Corso Como, Harrods, Conran Shop, Selfridges, Globus and Fortnum & Mason.